FC Hound Dogs are a futsal and football club currently playing in the Gibraltar 2nd Division. The club was founded in the summer of 2012 by Chris Gomez, Carl Bradford, David Bradford and Ercan Mehmet. The 4 of them set up the club from scratch, and later added Tyrone Smith to the backroom staff for the 2013-14 season. Chris and Tyrone had both been involved in coaching youth football for many years in Gibraltar, and as a result, had a group of young players interested in signing for them. The vast majority of this group of players had been involved with Chris and Tyrone at Lions Gibraltar, and later SJ Corinthians, where they played alongside Ercan during the 2011-12 season and gained invaluable experience playing in the Gibraltar Premier Division. Following the fold of SJ Corinthians at the end of the 2011-12 season, these young players had no club to play for, and as a result FC Hound Dogs was born. After raising money through the players to register the team for the 2012-13 season, sponsorship was secured from the Calpe Hounds pub for kits and footballs. In their inaugral season (2012-13), FC Hound Dogs finished in a respectable 4th position in Division 2 with 30 points from 18 matches. They took 4 points from 2 games against eventual league champions, College Cosmos and also recorded a 4-0 win over eventual league runners-up, Gibraltar Phoenix. They also had the joint best defensive record in the league, conceding 22 goals in their 18 league games, the same amount as Gibraltar Phoenix and Sporting FC. 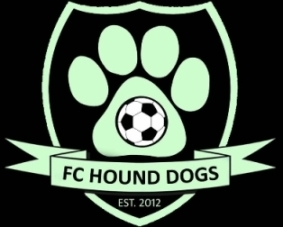 Prior to the 2013-14 season starting, FC Hound Dogs elected a committee consisting of President (Sean Harrison) , Vice President /Treasurer (Kristian Sanchez) and Club Secretary (Ercan Mehmet) to assist with all club matters so that Chris could focus purely on match day responsibilities. FC Hound Dogs struggled to get going at the start of the 2013-14 season, winning only 2 of their first 8 league games, but after beating FC Olympique 4-2 at the start of December, FC Hound Dogs turned a corner and went on to lose only two of their remaining 13 league games. Like the previous season, FC Hound Dogs finished with the best defensive record in the league, conceding 23 goals in their 22 league games. The 2014–15 season saw a new look FC Hound Dogs side following the departure of a number of key players to University. Another slow start and a run of disappointing results saw FC Hound Dogs at the foot of the table for the first time in their existence. December proved to be the turning point yet again; a victory against Boca Juniors F.C. (Gibraltar) boosted confidence going into 2015 and FC Hound Dogs won 6 of their remaining 16 league matches to finish 11th. The 2015–16 season saw the youngest ever FC Hound Dogs squad as the club continued it's policy of blooding young Gibraltarian players in Senior Football; there were a number of 16 year old debutants including Sean De Soto, Etien Victory, James Simpson, Ivan Borg and Jake Cameron. After making a good start to the season taking 4 points from the opening 2 matches, they had to wait until November to register another victory; a string of defeats followed despite some encouraging performances and FC Hound Dogs were unlucky not to take a point off of unbeaten Champions Europa Point F.C. who eventually went on to win 4–3 in a tense battle before Christmas. That performance was followed up by a victory against Cannons F.C. to kick off 2016, however a number of disappointing results followed where only 1 point was taken from the next 5 league games. Goals were hard to come by but they battled until the end and managed to get 2 wins and a draw in their remaining 6 matches to finish the season in 10th. After completely overhauling their Futsal squad in favour of signing younger local players in line with the club's philosophy, FC Hound Dogs struggled to get going in the early stages of the season; despite a better second half to the season they were disappointingly relegated from Division 3 and will start the 2016/17 season in Division 4. Due to a number of teams dropping out of the league, FC Hound Dogs were given a reprieve and reinstated to the third division.